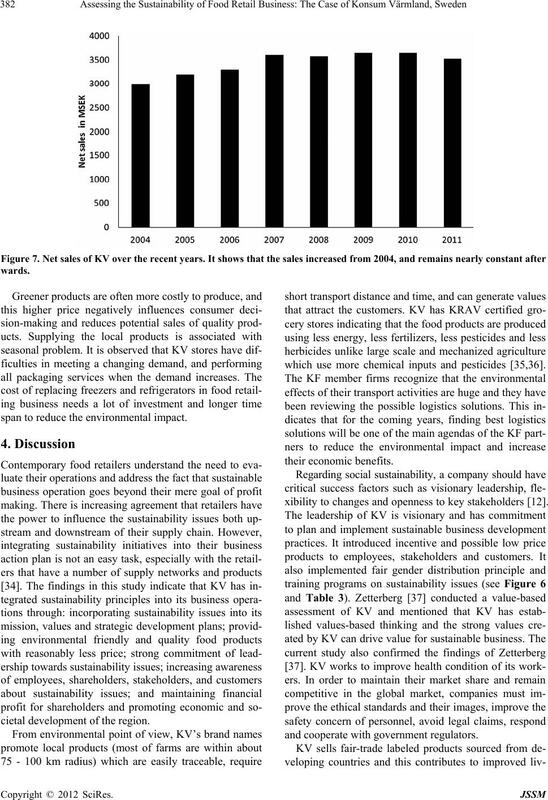 sustainability theory. 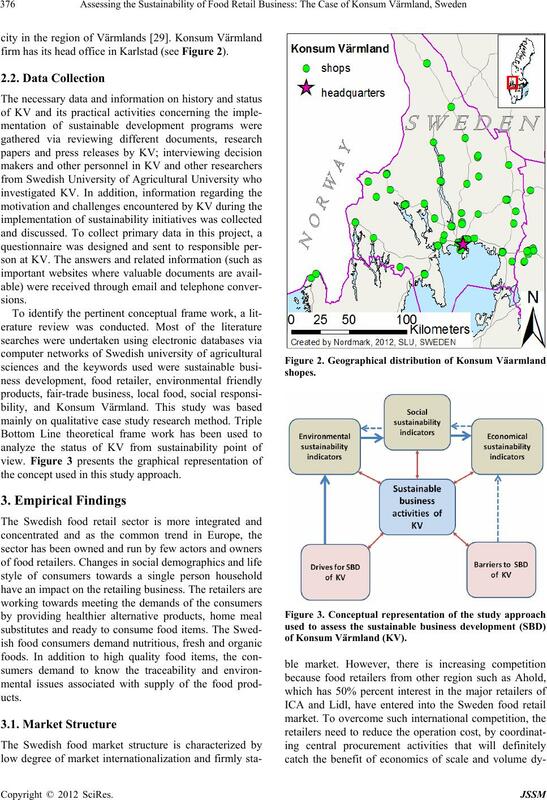 The findings indicate that KV has incorpor ated the su stainability issu es into its mission and v alues. product, and high cost of large scale investment. the food system is more consumer-driven than before . and their ability in sh aping up the consumer behavior. 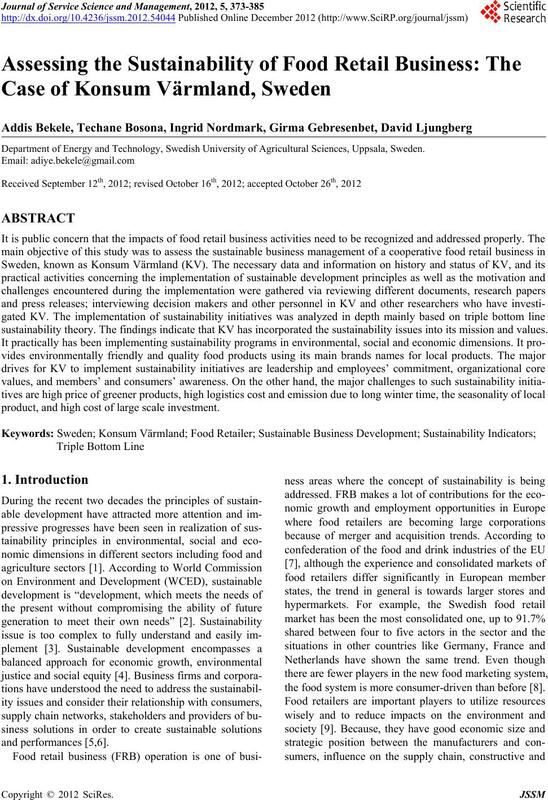 European policy on sustainable business development. to produce trustworthy and accessible reports. bottom line (TBL) theoretical frame work. such as public relations and Good will. Figure 1. 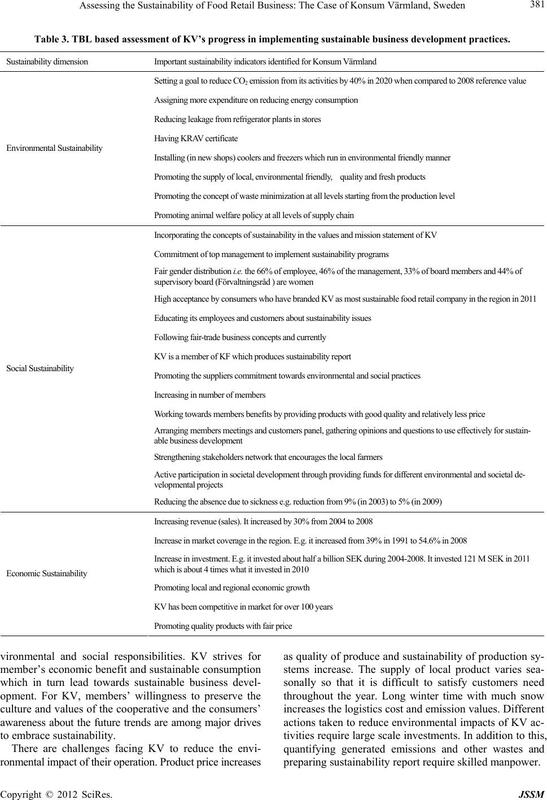 Triple bottom line parameters. the employees in addition to their profit pursuit. the corporation discr e tion). issues as presented in Table 1. There are also some arguments against CSR [25,26]. abstract combination of the three pillars of sustainability. nomic systems at the local national and global levels”. system or on the society from stakeholder point of view. progress in implementing its sustainability programs. challenge to develop sustainability metrics/indicators. firm has its head office in Karlstad (see Figure 2). the concept used in this study approach. den, covers about 5.7% of the market share. a food market share of 5.7% in Sweden. Figure 4. Market share of major food retailers in Sweden. areas of the Globe the opportunity to improve their lives. mental protection (ww w.fairt rade.org.uk). costs, and to improve the waste management procedures. tion from lighting, heating and cooling. freight transport and coolants and refrigerators plants. decreased during the year 2011 from 13% to 10%. lutions are underway to overcome the issue. choices such as KRAV certified products (www.krav.se). tilizers and genetically modified organisms. hygiene, pest control, staff training, water supply etc. and other Swedish leg islation on the hand ling of food. Konsum Värmland is well known brand in the region. favoriter (supplying meatballs) (see Figure 5). consumers and workers in the abattoir. affect the welfare of animals. Figure 5. Local brand names of Konsum Värmland ( www.Konsumvarmland.se).  All animals are kept untied. network that encourages the local farmers. colate, sugar, jam, honey, vegetables, pasta and oil. is retailer that supplies environmentally friend ly products. this, it works with universities and schools in the region. 2011 most probably due to technological advancement. ployees and leadership for recent years. Table 2. 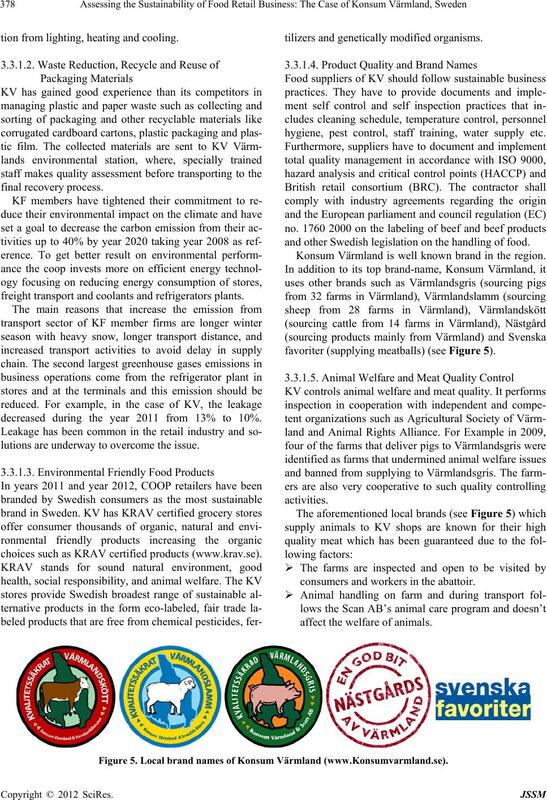 Recent financially information of KV and some food retail firms. 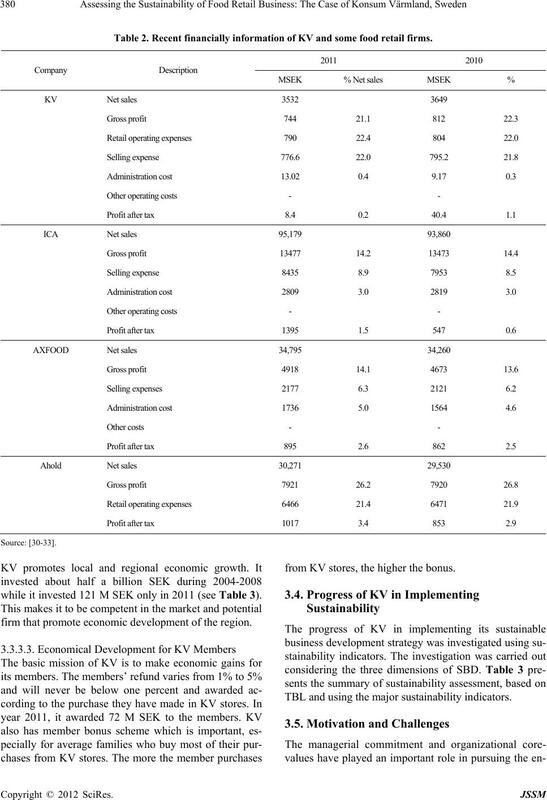 while it invested 121 M SEK only in 2011 (see Table 3). firm that promote economic development of the region. from KV stores, the higher the bonus. TBL and using the major sustainability indicators. Table 3. 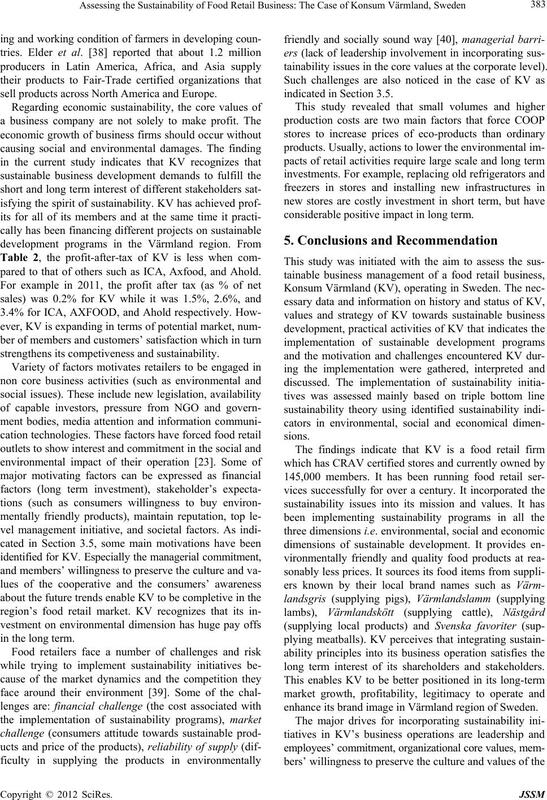 TBL based assessment of KV’s progress in implementing sustainable business development practices. 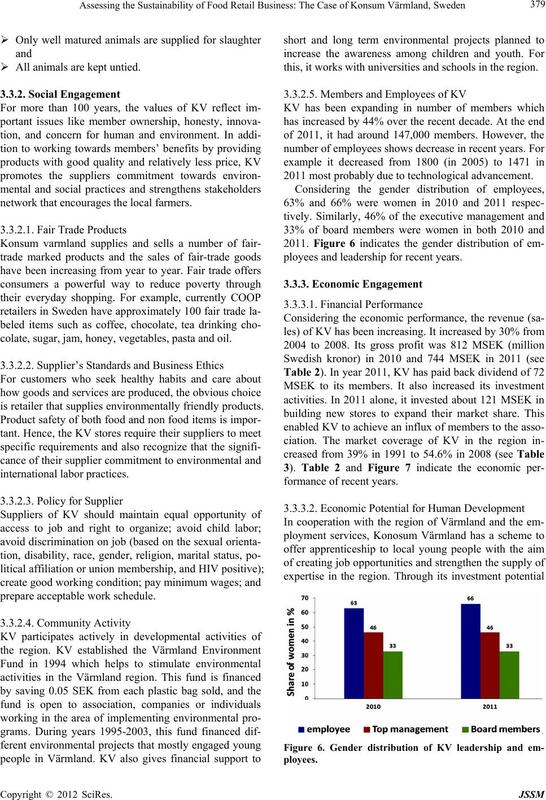 preparing sustainability report require skilled manpower. span to reduce the env ironmental impact. cietal development of the region. which use more chemical inputs and pesticides [35,36]. xibility to change s and openness to key stakeholders [12 ]. and cooperate with government regulators. sell products across North America and Europe. pared to that of others such as ICA, Axfood, and Ahold. strengthens its competiveness and sustainability. tainability issues in the core values at th e corporate level). indicated in Sect i on 3.5.
considerable positive impact in long term. long term interest of its shareholders and stakeholders. enhance its brand image in Värmland region of Sweden. 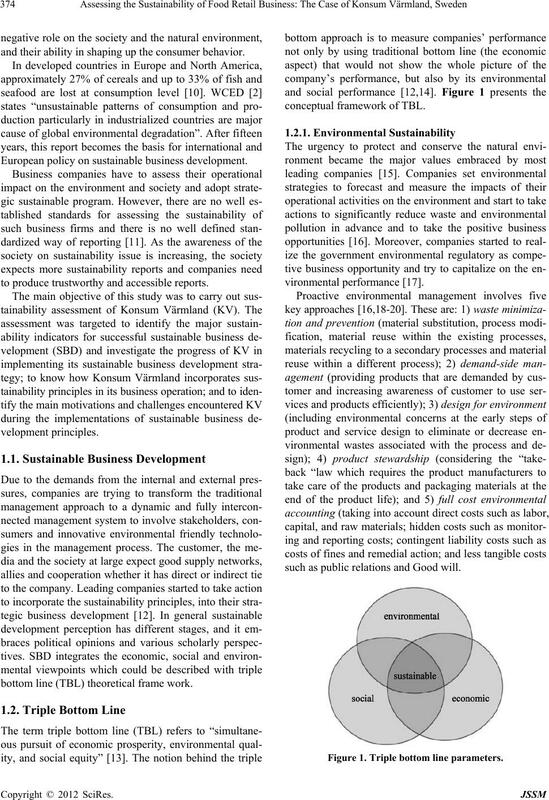 duced yet comp rehensive sustainability report. ment and Environment Department, FAO, 2012.
line. March/April Edition, 2003, pp. 1-5.
for Disassembly,” Industrial Engineering , 1993.
of the Food & Drink Industries of the EU, 2008. Agenda?” World Development, Vol. 37, No. 11, 2009, pp. 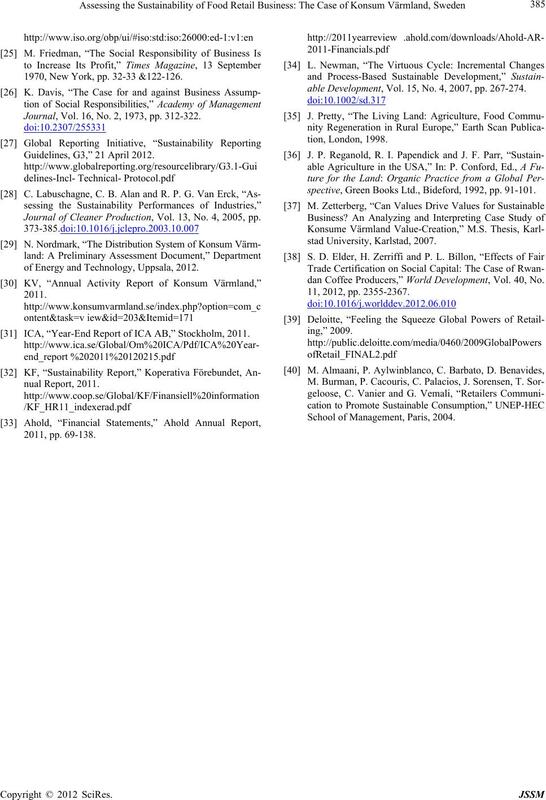 ses and Prevention,” Study Report, FAO, Rome, 2011.
able Performance,” European Management Journal, Vol. 23, No. 6, 2005, pp. 628-647. L. Maxey, “Can We Sustain Sustainable Agriculture? 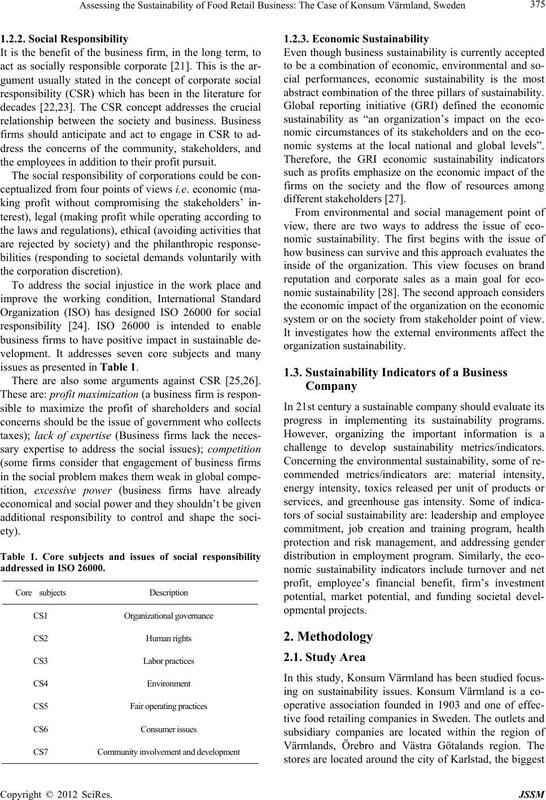 of ‘Triple Bottom Line’,” Business Ethics Quarterly, Vol. 14, No. 2, 2004, pp. 243-262. Science Research Imagination,” Sage, London, 1998. 2005), Vol. 12, No. 2, 1998, pp. 38-50.
of Standards and Technology, Washington DC, 1994. Chemical Week, Vol. 154, No. 9, 1994, pp. 25-26.
view, Vol. 4, No. 4, 1979, pp. 497-505. P. Jones, D. Comfort and D. Hillier, “What’s in Store? 1970, New York, pp. 32-33 &122-126. Journal, Vol. 16, No. 2, 1973, pp. 312-322. Guidelines, G3,” 21 April 2012. 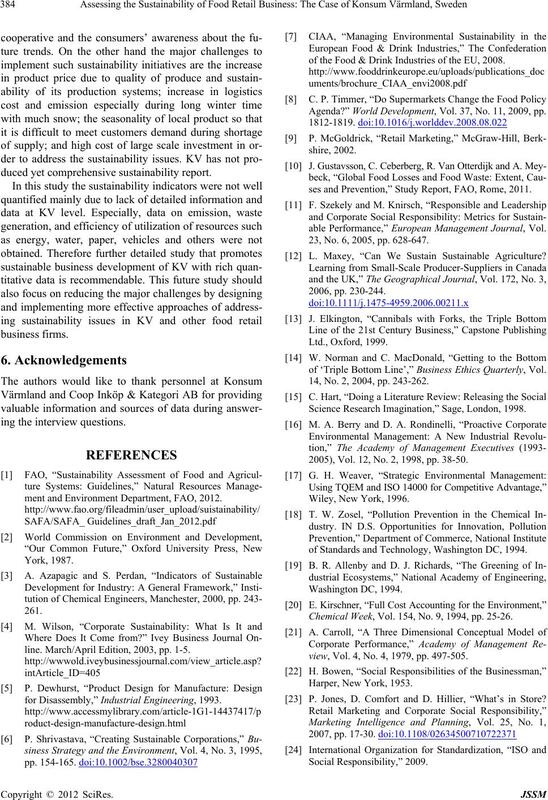 Journal of Cleaner Production, Vol. 13, No. 4, 2005, pp. of Energy and Technology, Uppsala, 2012. 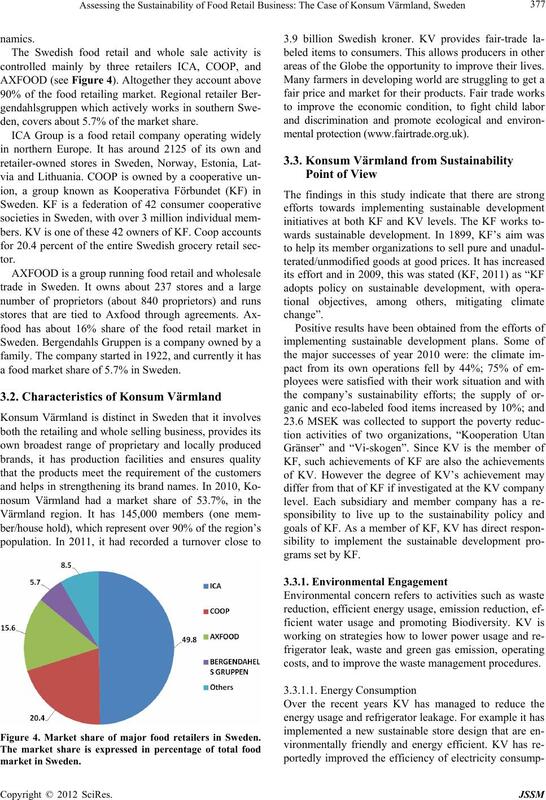 ICA, “Year-End Report of ICA AB,” Stockholm, 2011.
able Development, Vol. 15, No. 4, 2007, pp. 267-274.
spective, Green Books Ltd., Bideford, 1992, pp. 91-101.
dan Coffee Producers,” World Development, Vol. 40, No. School of Management, Paris, 2004.